Description: First published in 2003 this is a new edition of a work that remains the only study of the nave platform known as the Syrian Bema to utilise an interdisciplinary approach. 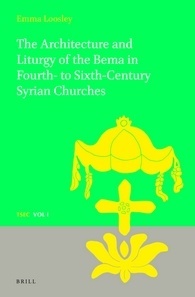 By combining archaeological and architectural research with a study of the Syriac Liturgy to explore how worship evolved on the Syrian Limestone Massif in Late Antiquity, this volume proposes a solution to the long debated question of why only approximately 50 of these bemata have been discovered amongst many thousands of late antique churches in Syria. It charts the evolution of the early liturgy in Syria and seeks to explain how the location of the Limestone Massif in the hinterland of Antioch may have affected the development of worship in the region. Citation: Robert Morehouse, review of Emma Loosley, The Architecture and Liturgy of the Bema in Fourth- to-Sixth-Century Syrian Churches, Review of Biblical Literature [http://www.bookreviews.org] (2015).